Fall is here! This is my favorite season in Chicago- “sweater weather.” I love the crisp fall air and the stunning colors in the foliage. Although I know we mourn the loss of those long summer days, it’s also fun to look forward to cozy evenings wrapped in a blanket, snuggling with our kiddos. Autumn is the quintessential midwestern season. I encourage you to embrace the change; this season of snuggling doesn’t last forever, so enjoy it while it’s here! Also take advantage of our “Spread the Love” October referral contest! The Forevermore Family with the most October Referrals will win a special edition Forevermore Blanket to snuggle with! The blur of the first few weeks of class is over, and the students and teachers are settling nicely into their classes and growing with the curriculum. I’m so grateful to be in the classroom and work hands-on with our students in both our dance and musical theatre programs. It’s really amazing to see how quickly kids adapt and learn new things; I truly love watching them learn and grow. We are off to the start of a WOW year for sure! Be sure to check out our “GIFT FOR YOU!” special offer for the month of October: we invite you to add a FREE group acting, creative drama, or musical theatre class. We are also offering a FREE group music lesson trial class - all exclusive to our current Forevermore Families and siblings. Did you know that all of our students are invited to “Bring A Friend" (or in this case a “Ghoul”) to Halloween Dress Up Week to share their love of dance, acting, and music with someone special? Don’t miss this fun week at Forevermore: October 24-30. Keep scrolling for more details! Parents, we thank you for being part of our studio family and are looking to a great year! Special Offer for Current Students! The arts have so many benefits for kids of all ages. Studies are showing that children who participate in the arts have better academic outcomes, higher career goals and more civic engagement. Now that's More Than Just Great Dancing! At Forevermore, we’re not just teaching skills in our classrooms—we’re developing curious, compassionate young leaders and equipping them for success! We know that it can be a challenge sometimes to know what to do to offer support and encouragement for your aspiring artist—especially if you are still new to the world of dance, theatre, and music! Although many of our young students take just one or two classes per week, dancing, acting, and singing is on their minds every day! Read arts related books together or listen to music and try some dance moves in the living room. This helps keep your child’s mind engaged about their performing arts classes in an extra-fun way—because they can share it with you! The way you praise your child can be very useful in helping them get the most out of dance class! Use phrases like, “I love watching you dance, act, or sing!” or “I can tell you’ve been working hard.” or “Did you try your best? That’s what’s most important.” Your child’s confidence and enthusiasm will continue to grow with this kind of encouragement at home and at class. We hope these three tips come in handy as your child progresses through the season, and of course we’re always happy to help with any class curriculum or programming questions you might have. Thank you for choosing to dance with us! 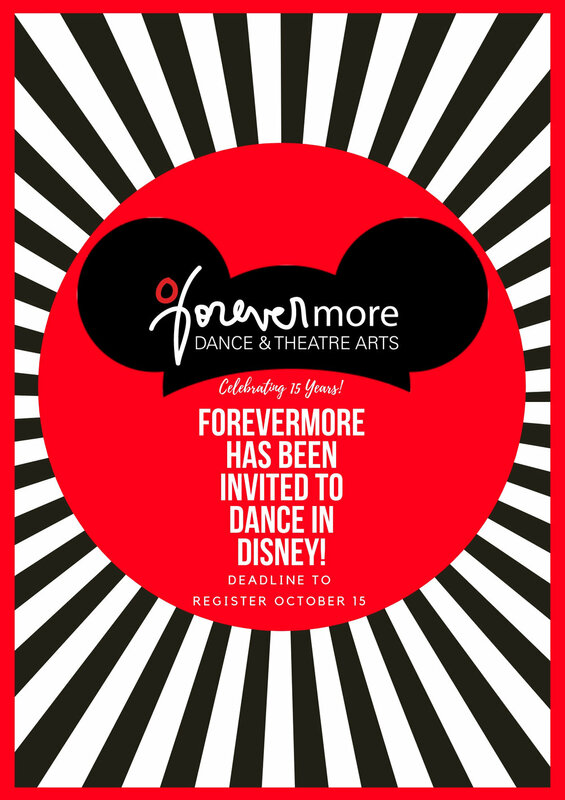 Forevermore is Going to Disney! Visit us at the front desk or email us at info@forevermorearts.com for more information on this special opportunity! Everyone is welcome! Performance opportunities are open to students ages 8 and up. The deadline to register is October 15th! Join us for a Flash Mob!